Western Sydney University's art collection of approximately 1,000 objects was formed from the holdings of its former network members, Hawkesbury, Macarthur and Nepean. It comprises of a diverse range of paintings, works on paper, photographs, mixed media sculptures and ceramics. 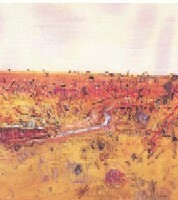 Primarily Australian artists from the 20th Century have been acquired particularly from the 1970's onward. Past and present staff and students are also represented within the collection, as well as local artists from the Hawkesbury, Macarthur and Nepean regions of Greater Western Sydney. International artists who participated in artist residency programs at the University. The University's Curator is responsible for the development, management, exhibition and conservation of the art collection. For further information about the art collection and exhibitions contact the University Curator, Monica McMahon, who is located in Building 3, on the Campbelltown Campus.